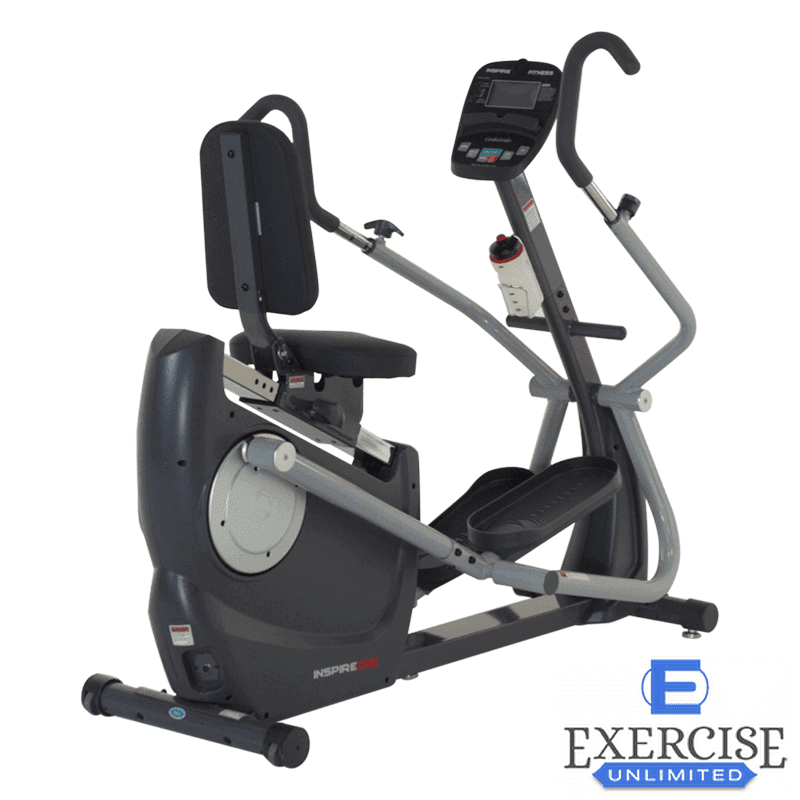 The Inspire Fitness Cardio Strider CS2 is an elliptical recumbent bike hybrid trainer featuring an automatic resistance system and a console with 8 programs. 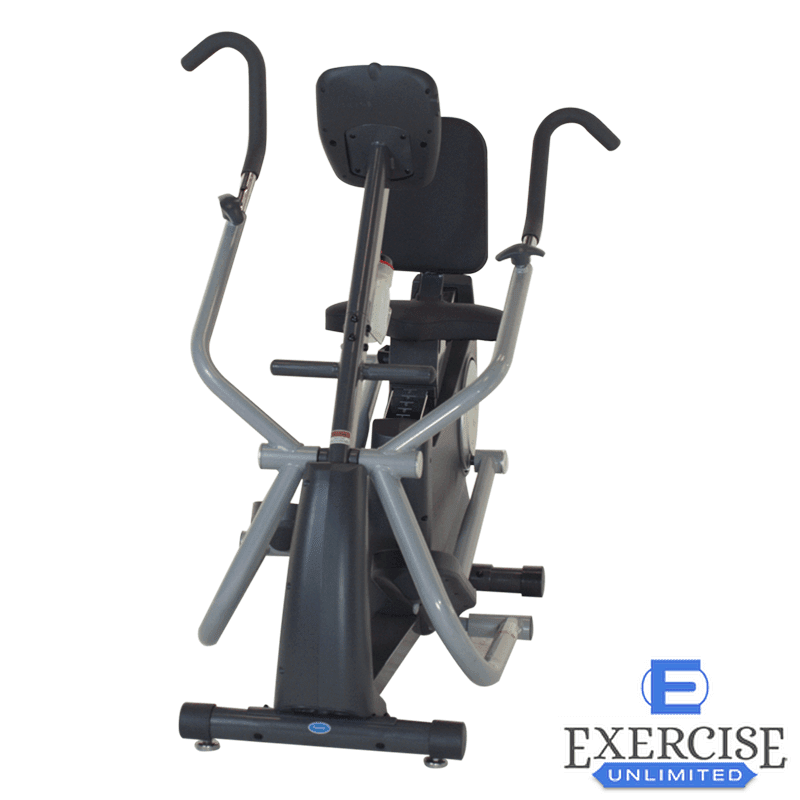 It has a durable, light commercial construction, a large, ergonomic seat, and offers 20 levels of resistance. 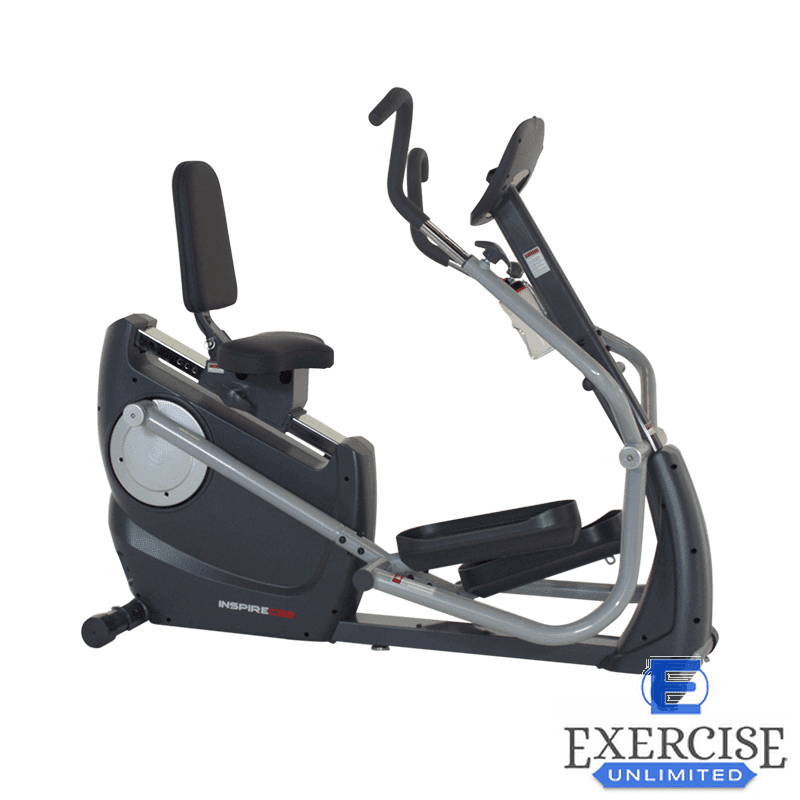 The Inspire CS2 Cardio Strider features a heavy-duty frame, all the parts in its construction being made of steel tubing. The only plastic parts in its frame are the covers of the motor and flywheel. With all the parts assembled, this trainer is fairly heavy. 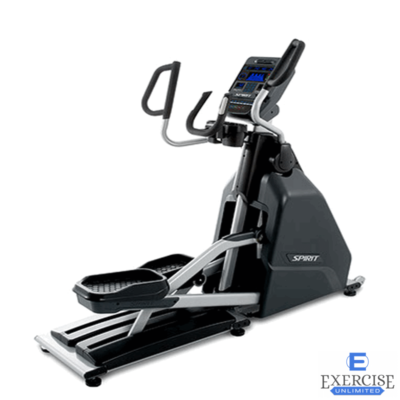 It weighs over 180 lbs, and this weight plays an important role its overall stability. On top of that, both its base bars are equipped with adjustable stabilizers. 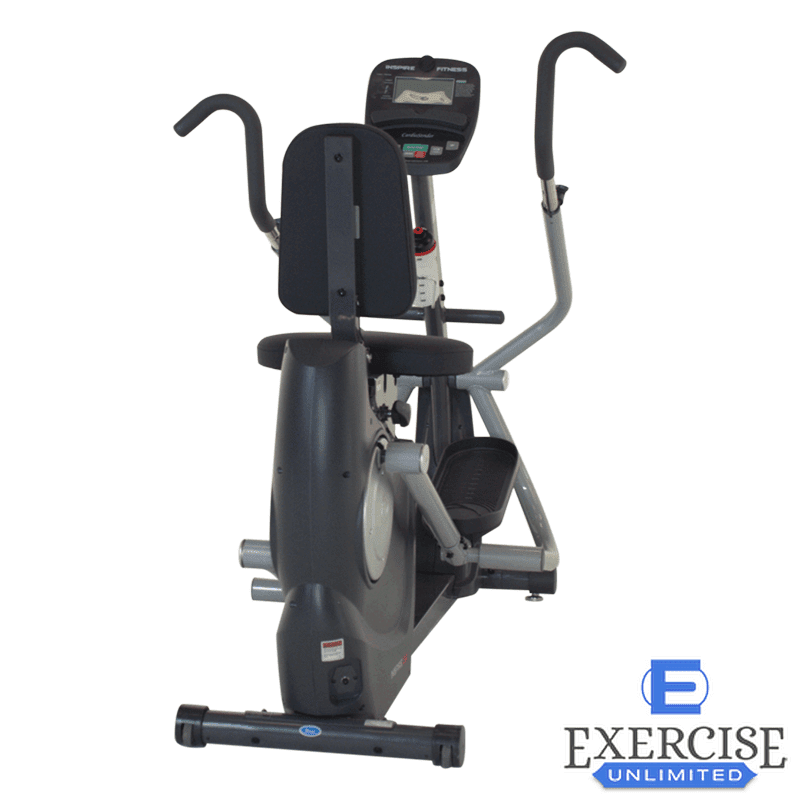 Therefore, you can perfectly level the machine on any type of floor, and it won’t wobble or move during exercising. 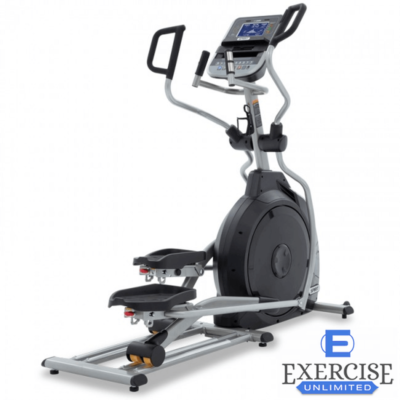 Although it’s a rather heavy unit, the Inspire Fitness Cardio Strider CS2 features two transport wheels integrated into the rear base bar. By using these wheels, the relocation of the unit is easy to carry out as you won’t be handling its full weight, only approx. 40%. The trainer’s footprint isn’t extremely large. However, it is approx. 59″ (150 cm) long, while its maximum width is given by the handgrips, being ~35″ (89 cm). The base width is only approx. 28″ (71 cm), though. 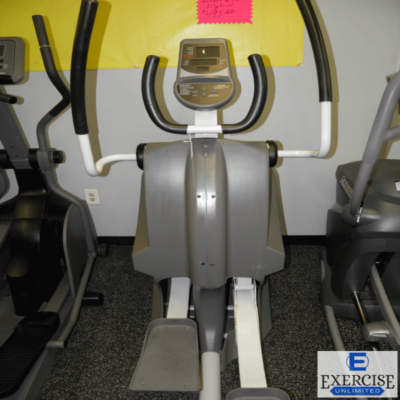 Along with these dimensions, it is recommended to assign at least two feet all around the machine for safe operation. 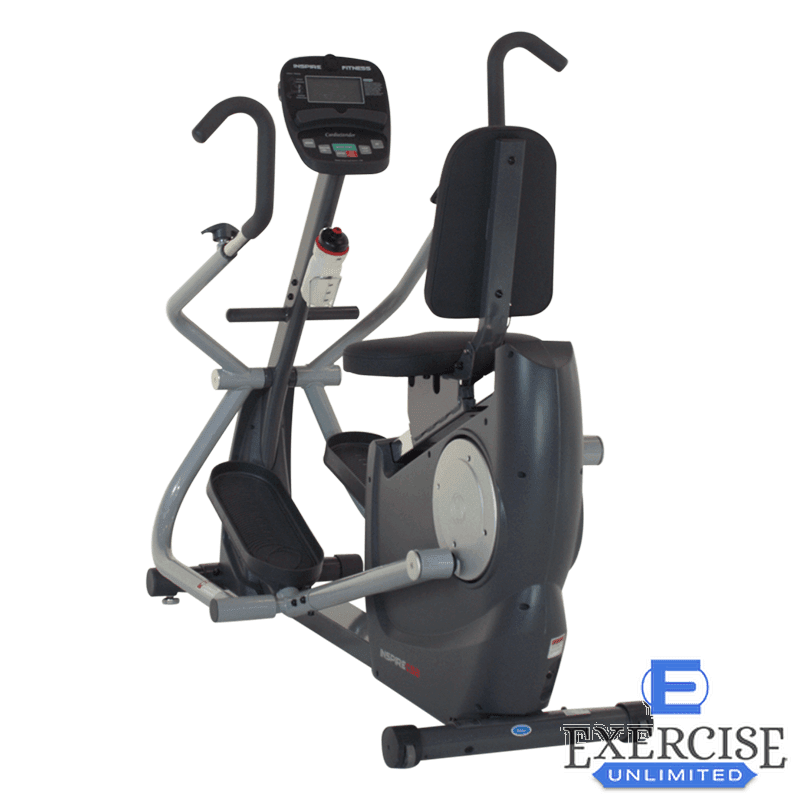 As opposed to other similar fitness machines, this trainer features an arms/pedals assembly made of four bars for each side. The joints between the bars integrate heavy-duty sealed ball bearings in order to provide a smooth motion. 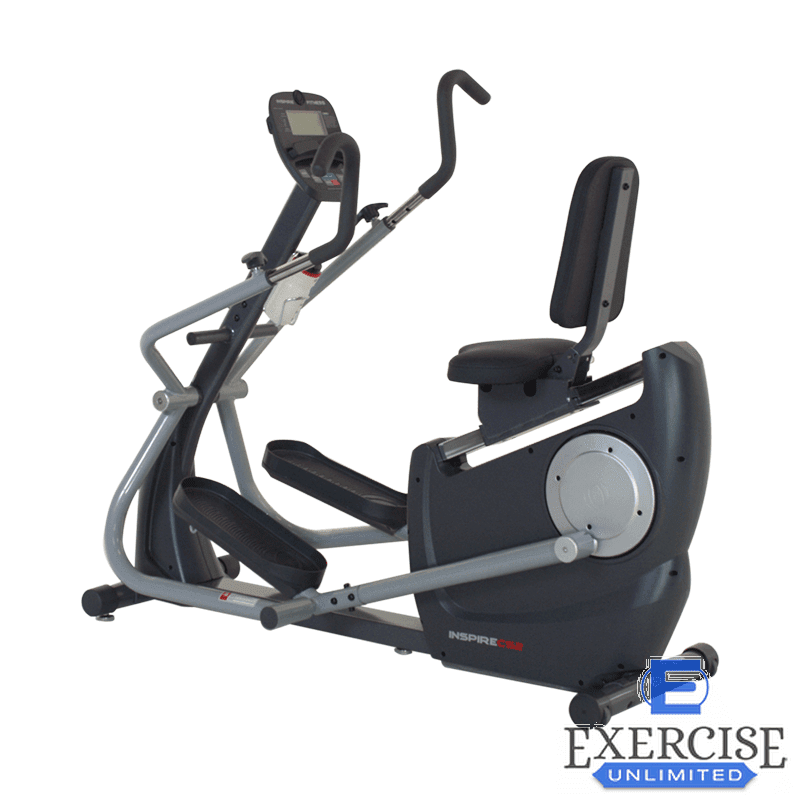 The moving handlebars are length-adjustable; each bar offers 6 adjustment positions, so you can adapt them perfectly to your arms’ length. They’re easy to adjust, each one being equipped with a large knob. They can also be inverted to provide a different grip type. Two other features present within the CS2 Strider are the footrest bar welded to the console mast and the stationary handlebars. The first one gives you the possibility to train only your arms while keeping legs fully extended. 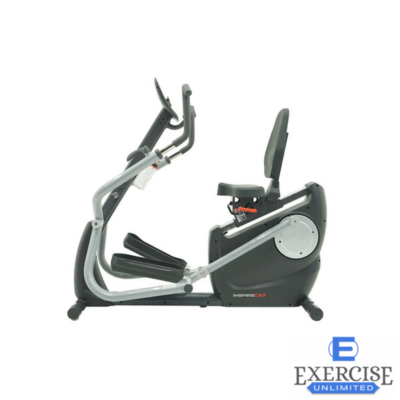 The second one allows you to train only your legs while resting your arms. 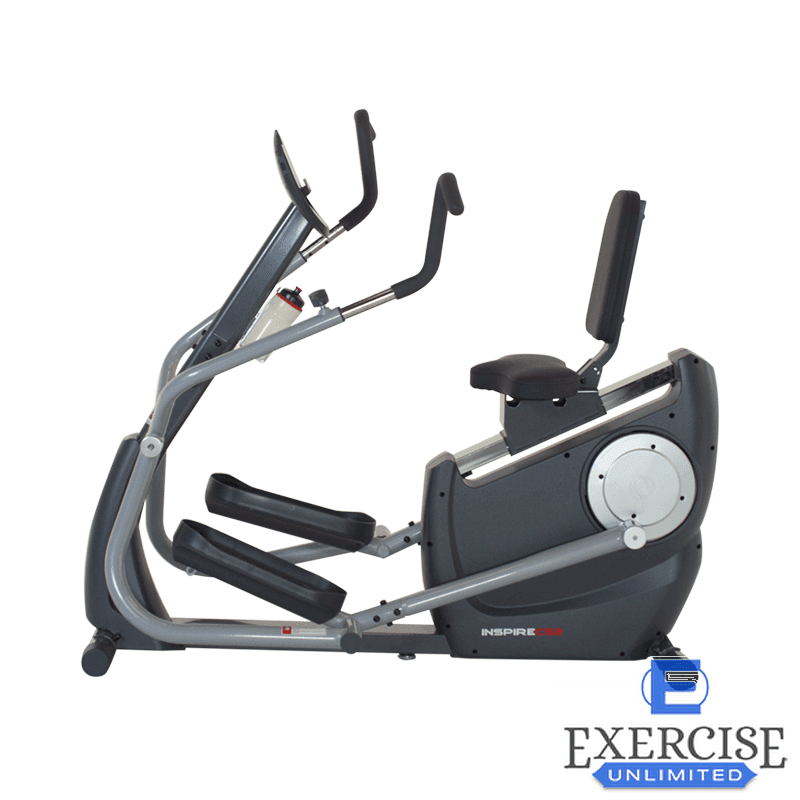 Also, the stationary handlebars integrate EKG sensors, so by holding on to them, the console can monitor your heart rate. Both the mobile and stationary handlebars feature rubberized grips for optimal comfort. 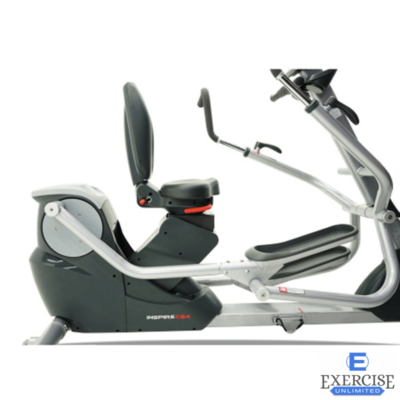 The Inspire Fitness Cardio Strider CS2 is equipped with a large ergonomic seat. Both the seat and the backrest integrate a consistent layer of padding. 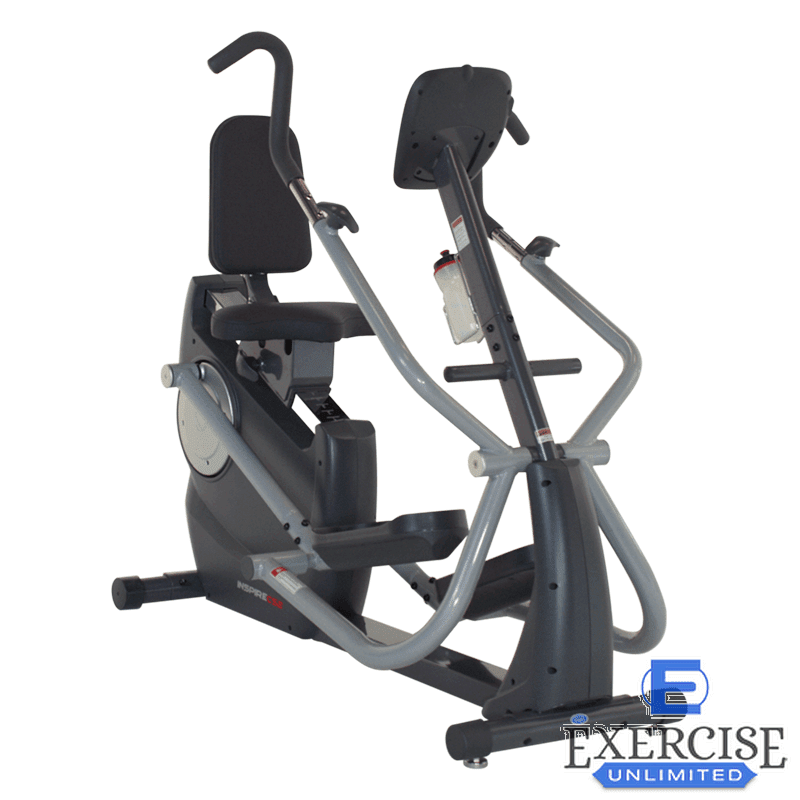 The backrest also provides excellent firmness, providing the required lumbar support for a correct form during exercises. The seat is approx. 17″ (43.1 cm) wide and 11.5″ (29.2 cm) deep, while the padding thickness on it and the backrest are approx. 2.25″ (5.7 cm). The seat is adjustable. It’s attached to an oblique rail system and you can lock it closer or farther in relation to the pedals. 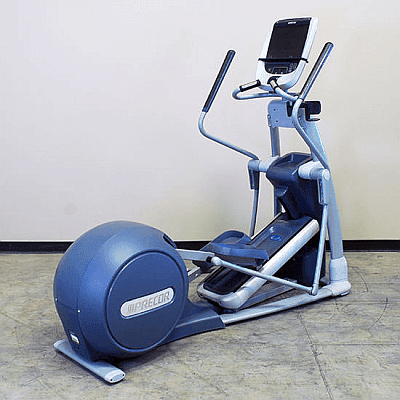 This being said, the machine can accommodate users up to 6’5″ (196 cm). 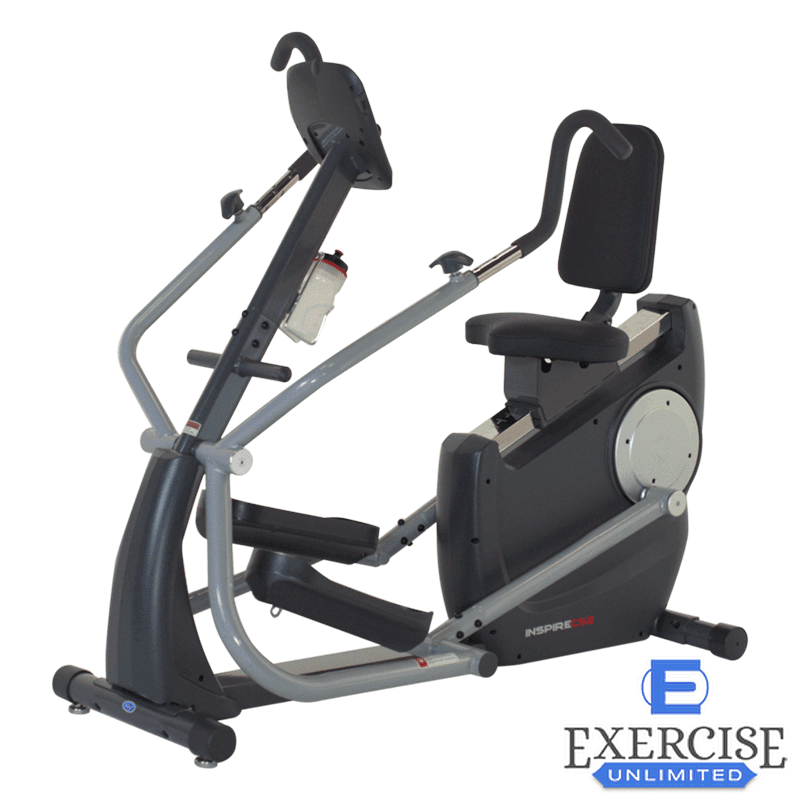 In case you’re wondering, the seat does not tilt, and the backrest doesn’t recline, nor does it offer any independent adjustment possibilities from the seat. One last aspect to mention here regards the trainer’s paint finish. All the steel parts in its construction feature a double powder coating which is rust-resistant and scratch resistant. The color used for the base frame parts is black, while the bar components of the arms and pedals are gray. Also, the adjustable handlebars feature a chrome finish.